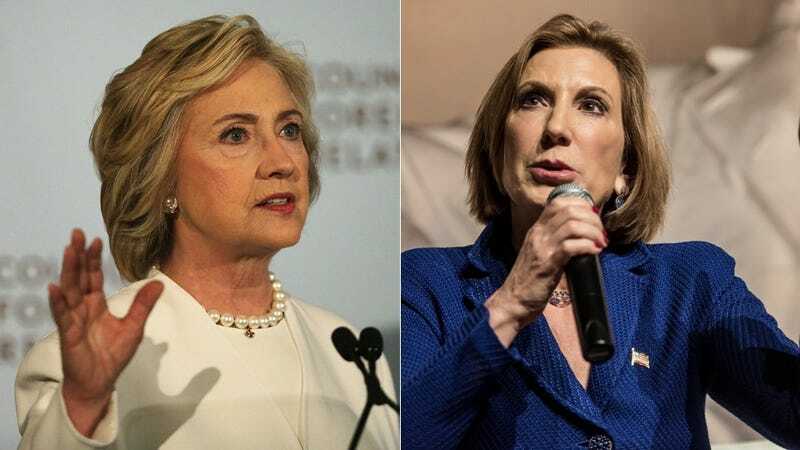 Confused Rich People Are Backing Both Clinton and Fiorina, Because What's the Diff? So here’s a phenomenon: non-lobbyists financially backing two political candidates of opposing parties with completely conflicting views and experience levels. Political website The Hill interviewed a full 17 people who have donated substantial amounts to the campaigns of both Hillary Clinton and Carly Fiorina, only five of whom agreed to speak on the record. For the most part, they expressed significant interest in electing a woman president and far less in their respective agendas. He says his top concern when deciding which candidate to support is foreign policy experience, but he concedes gender had something to do with his decision to support both Clinton and Fiorina. Sure would! Except in specific instances like Carly Fiorina, a failed business executive with no political experience whose personal moral lapses are only outshined by her frightening desire to strip women of their health care options. “I want to see more female CEOs in America and the world, and it’s imperative for the economy that we utilize all of its population and the enormous amount of talent who are on the sidelines,” added Lizarraga. “Any woman who has something meaningful to say and takes that risk has my attention,” said Julia Copeland, a lawyer at HMP Law Firm in Charleston, S.C., who gave $1,000 to Clinton and $500 to Fiorina. “I base it off their competence and if they could do a good job in office,” said Fasseas, who has given $2,700 to Clinton and $500 to Fiorina. For all of their differences, however, the named donors have a few things in common: they’re white people with disposable income. In other words, no matter who wins the presidency, they’re probably going to be just fine!